I had a calendar a few years ago and I always liked the pictures, so I saved them and they were perfect for this. 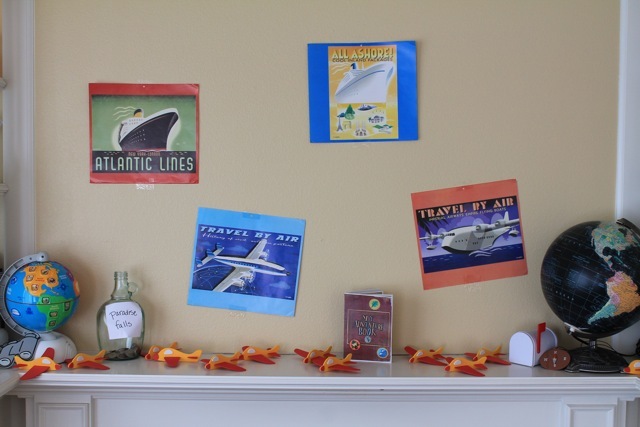 We pulled out a couple of globes, a jar for saving for "Paradise Falls," the mailbox, and lots of little foam planes. 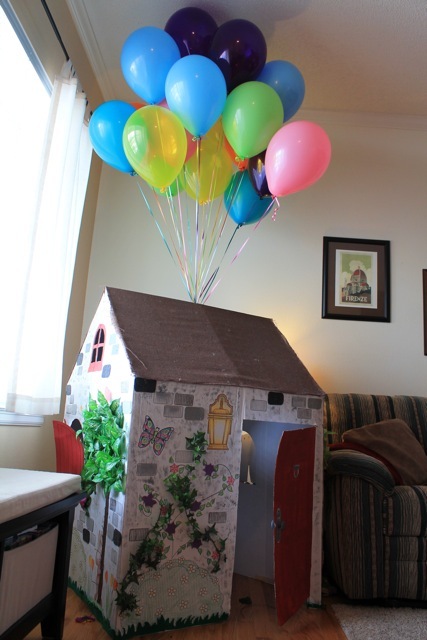 We turned the cozy Christmas cottage into the flying house. 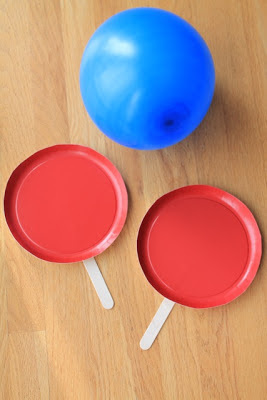 I made some paper plate paddles for balloon tennis. I trimmed off the outer 1/2 inch and hot glued on some large craft sticks. Balloon tennis is pretty great by itself. Thing One was happy to play for a long time, while I did other set up stuff. We will be using these post-party for sure. 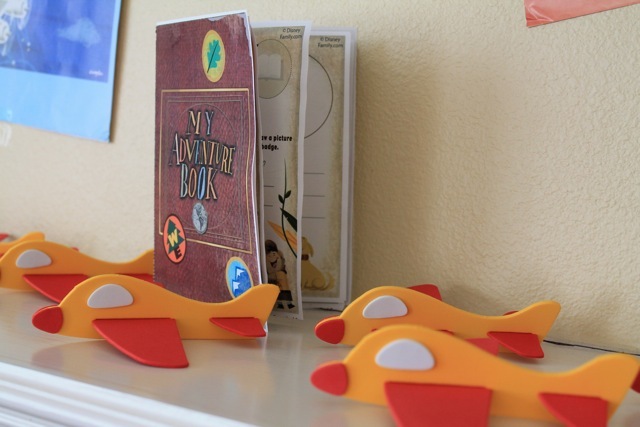 The foam planes were a late summer clearance score. Hobby Lobby has the best deals at the end of VBS season. These crafts are perfect for parties because they are sets for a whole class and they usually run them 70-90% off, eventually. 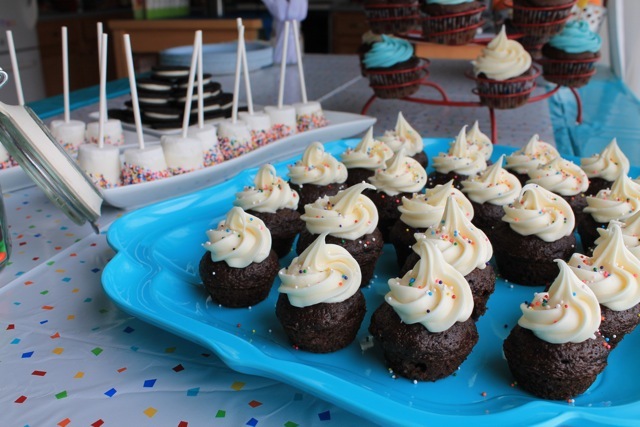 It was an afternoon party, so there were munchies and fruit and desserts included cupcakes, mini cupcakes, chocolate and sprinkle-dipped marshmallow pops, Oreos and m&ms. 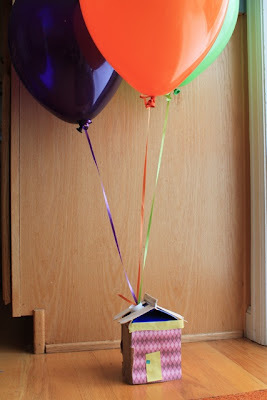 We planned a house craft for all the kids. 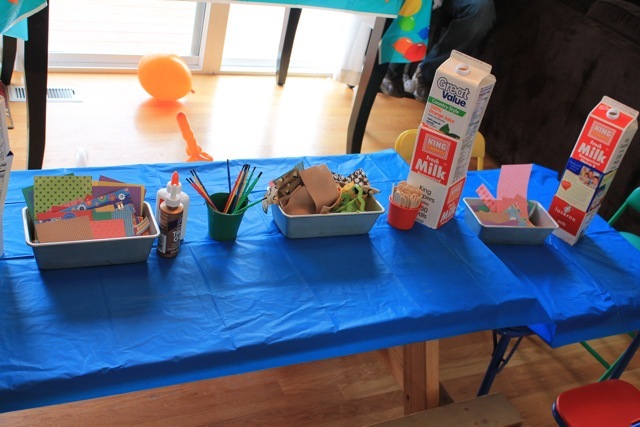 I cut the bottoms off of lots of milk cartons, and then put out glue, papers, fabric pieces and craft sticks. Everyone chose a "house" and decorated it however they wanted. 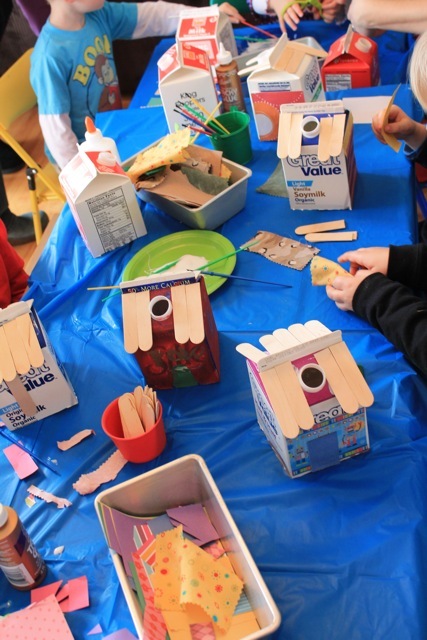 I think the kids really liked making the houses. When they were done, each house got it's own balloon. We taped the ribbon to a half a drinking straw, and slipped it in through the pour spout. Then the straw turns sideways and holds the balloon in place. For favors we printed out mini versions of the Adventure Book which you can download for free at this Disney website. It's a great book of family and individual activities for kids to do to earn badges, which you cut out and glue on once they earn them. 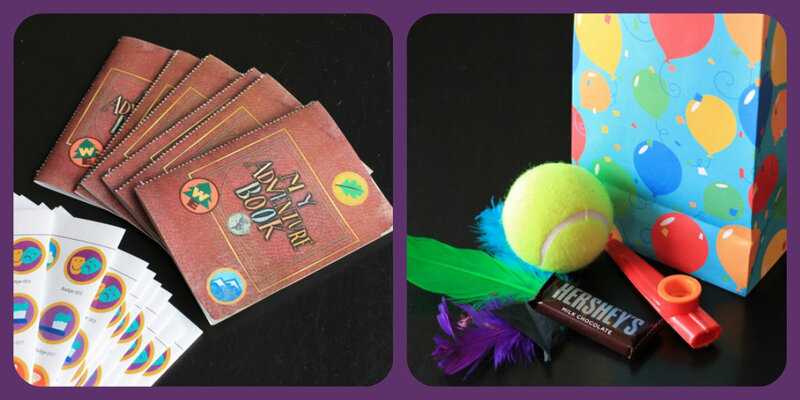 The favor bags also had a chocolate bar, a tennis ball, a kazoo and some feathers. Adventure is out there! Thanks for reading! !!!! We just watched part of this movie today. This kids love it! I think I have found my next theme. Thanks for sharing at Mom's Library! Hi! can you point me in the right direction! i am looking to print out those adventure books! please tell me where to find them bc i was on the disney site and couldnt find them at all! thank you so much! The link is in the text above where it says download at "this disney website." if you just click on that phrase it takes you right to the page where you can download it. Hope that helps! are those dollar store paper plates? I like how flat they are. I don't remember where I got the plates, but any paper plate can be made flat by just cutting off an inch or two of the outer edge. Visit Haley @EverNeverAgain's profile on Pinterest.